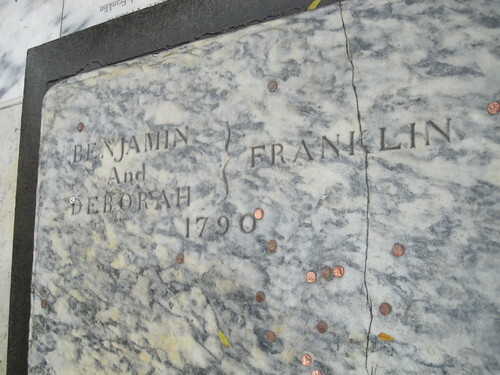 This is a photograph of the grave of Benjamin Franklin and his wife, Deborah, at the Christ Church Burial Ground. For a better view of this photo, just click directly on it - you'll be able to read the names of the Franklins, and see the pennies traditionally tossed on their grave. Benjamin Franklin was an inventor, printer, author, diplomat, statesman, scientist, public servant, organizer, and resident sage - simply put, he was the greatest Philadelphian, ever. More than three centuries old, he remains a fascinating figure. On this page, you can learn more about the places to visit in Philadelphia, most closely associated with Franklin. As of this writing - summer 2010 - we'd highly recommend that you visit Franklin Court, as it will be closing to the public, for an extensive renovation, soon. There are other locations in Old City Philadelphia that are also closely associated with Franklin. City Tavern is an authentic recreation on the site of the actual, 18th-century City Tavern, the favorite hangout of not only Franklin, but all of the Founding Fathers, while they were in Philadelphia. Over at Christ Church and Burial Ground - note that Christ Church and its Burial Ground, with Franklin's grave, are not adjacent to each other - you can see Franklin's final resting spot, a biographical plaque, and toss pennies onto his grave, for good luck... an old Philadelphia tradition. Independence Hall was the scene of two of Franklin's most important contributions to America. It was the site of the Second Continental Congress, which approved the Declaration of Independence in 1776. It was also the site of the Constitutional Convention in 1787, which created the U.S. Constitution. As an elder statesman in both, Franklin played key roles in ensuring the compromises - and thus the adoption and acceptance - of both of America's most important documents. Right down the street from Independence Hall, is the current location of the American Philosophical Society - which Franklin founded in 1743, nearly a quarter of a century prior to the Declaration of Independence. It is the oldest learned society in America, and has a great, often overlooked Museum to visit. Over on the other side of Broad Street, the Franklin Institute is a cutting-edge science museum, created in Franklin's memory in order to promote scientific learning, and interest in the subject, which Franklin did so much to advance... and naturally, it is located on the Benjamin Franklin Parkway named in his honor. We are in the process of building more Franklin pages. For right now, the first one - now completed - is the Franklin Timeline. This page is a good start, in order to familiarize yourself with Franklin's life story, how it intertwines with that of Philadelphia and the United States in general, and will help you better enjoy your visit to the many Franklin-themed Philadelphia attractions. The second page - Benjamin Franklin Inventions - is a good summary of some of Franklin's most famous inventions, such as the lightning rod and the Glass Armonica, the first musical instrument invented in America. This page is also now completed. Subsequent Benjamin Franklin pages will be created, so please check back for more content.